Market State 2: Bullish/Rational (14 trading days): - Market State 2 is typically in place following a short-term market correction. Markets or securities do not go up in a straight line. 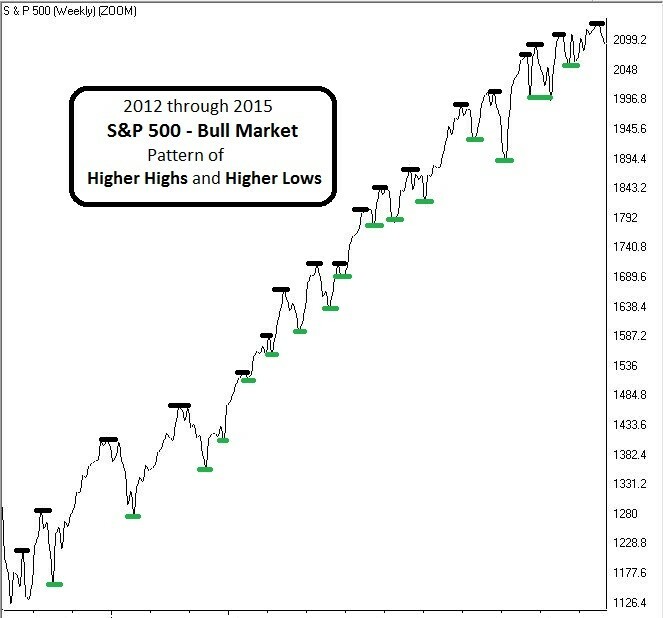 A typical bull market pattern will look similar to a stair step pattern of new highs followed by a pullback that is higher than the previous low followed by a higher high. 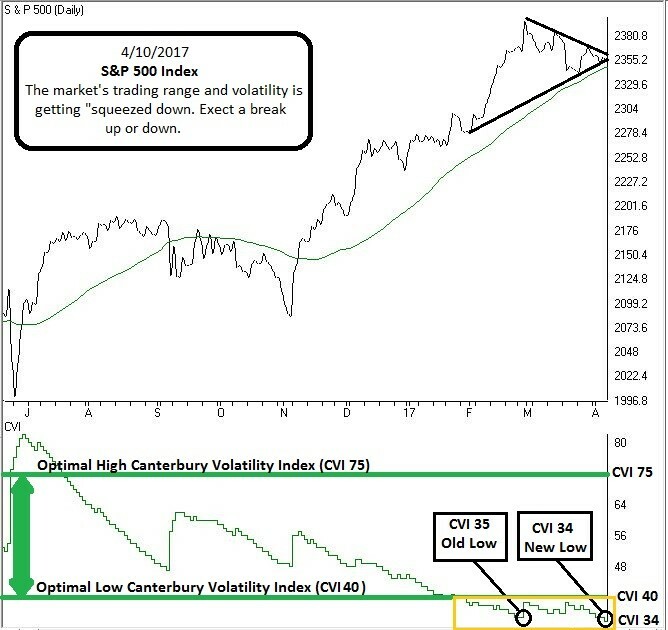 Canterbury Volatility Index (CVI 34) The S&P 500’s volatility remains at an extreme low level. In fact, the CVI is now one point lower than its previous low 10 years ago. The last time the volatility was lower was January 7, 1994 at CVI 32. This type of market environment can experience one day outliers of 1.25% or more. The NASDAQ 100 has continued to outperform the S&P 500. Most U. S. equity market indexes perform better when the NASDAQ is stronger than the S&P 500. The Portfolio Thermostat Markets remain in a Bullish Market State. The S&P 500’s momentum has grinded to a crawl. The Technology and Financial Sectors are carrying a large percentage of the S&P 500’s performance. The S&P 500 is masking the weaknes in US equities overall. 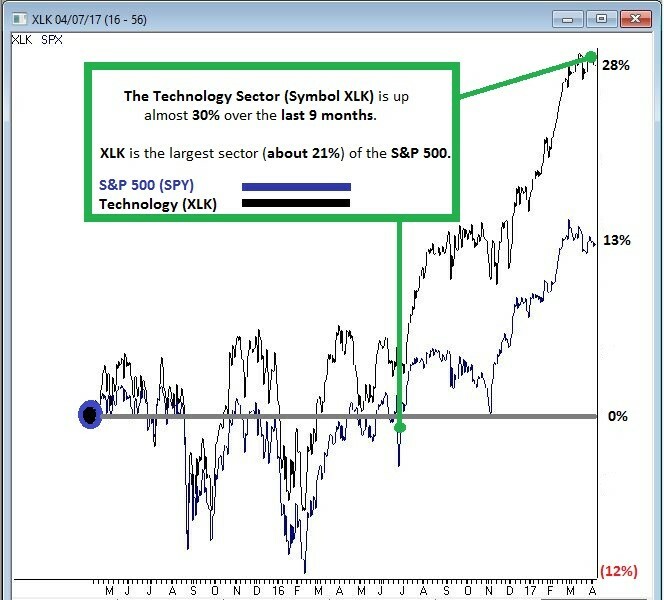 The Technology, and to a lesser degree Financial Sector, are over extended (parabolic advance). The S&P 500 is only down about 1.7% from it’s March 1st high. Our studies show that corrections of 5% or less are random market noise. Don’t confuse the upcoming volatility, that is a result of squeezing down the trading range, with a move to a Transitional or Bearish Market State environment. The Portfolio Thermostat’s algorithms will tell us when there is a shift in the market environment. As it stands now, we remain in a long term bull market. Even more important, our Canterbury Portfolio Thermostat holdings continue to achieve the internal metrics required to remain in a bullish Portfolio State. We have a year end video available to anyone who would like a more indepth understanding of the Canterbury Portfolio Thermostat process. Contact our office for more information.